Following its successful run last year, UNU-FLORES officially launches its online courses in its second consecutive year today. Hosted on the Blended Learning Platform of the Nexus Observatory, the courses will run till 11 December 2016. Nested within the Nexus Observatory, the online courses aim to equip decision makers, practitioners, and students anywhere in the world with access to relevant knowledge in addressing capacity development needs and to develop new skills on how to apply the acquired knowledge in practice. Experts from Imperial College London (UK), Livelihoods and Natural Resources Management Institute (LNRMI) (India), and University of Minho (Portugal) collaborated to design the curriculum. 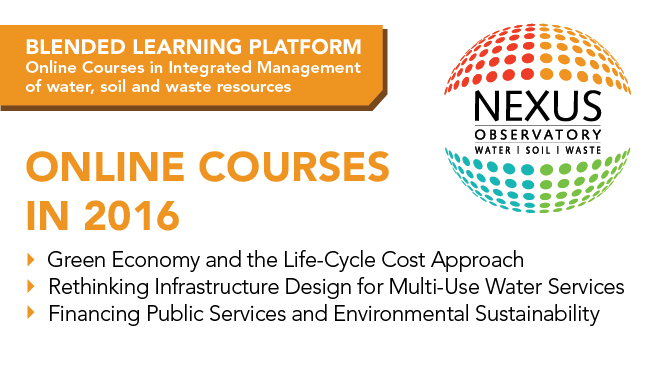 The three online courses are delivered with partners at the Leibnitz Institute of Ecological Urban and Regional Development (IOER) and the Faculty of Environmental Sciences of the Technische Universität Dresden. The courses consider the Nexus Approach from different methodological perspectives. They advance the nexus concept through a focus on life-cycle analysis (Green Economy and the Life-Cycle Cost Approach), multiple uses (Rethinking Infrastructure Design for Multi-Use Water Services), and intergovernmental fiscal relations (Financing Public Services and Environmental Sustainability). Over 12 weeks, participants will be exposed to policy-relevant topics and are encouraged to put on a problem-solving attitude in dealing with them. 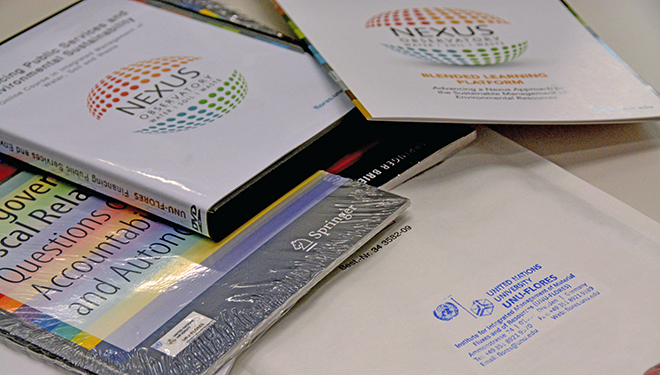 Course participants receive a DVD with course lectures and supporting textbooks. Upon successful course completion, they will be issued a certificate by UNU-FLORES. As with last year, the online courses attracted applicants from all parts of the world and sectors.